Polly, the founder and managing director of the Reef Conservation project in Belize, spoke to us earlier this year about what the project has achieved over the last 12 months and what they’re hoping to achieve in 2015. What has the Reef Conservation project achieved in 2014? We have successfully removed 7084 lionfish from Southern Belize waters. We dissected and analysed the stomach contents of 574 lionfish to monitor and learn more about their diet and therefore their impact on the ecosystem. We collected more data on lionfish in Belize than any other organisation and provided the fisheries with much needed data to help to further control this invasive species. What developments or changes have taken place at the project in the last year? We have developed a program with local women where we remove the spines and fins from the lionfish and given them to the women to make jewellery and other items. We then buy the merchandise from the women and sell them to guests and passing sailboats. This initiative provides an income for the women and the project. What do you hope that the Reef Conservation project can achieve in 2015? We will be continuing with our ongoing research initiatives with commercial species, general health of the coral reefs and lionfish. Is there a correlation between shrimp/small fish abundances and lionfish abundances at particular dive sites? Are lionfish with empty stomachs more frequently in dive sites with higher lionfish abundances – so are lionfish depleting food sources in certain areas of the reef? Do their feeding habits vary seasonally? What is the primary food source of juvenile lionfish? Do female lionfish feed at higher rates prior to developing eggs? Do their feeding patterns change after they develop eggs? Continued analysis of stomach content from lionfish invading the southern Mesoamerican Barrier Reef can be beneficial for managing lionfish populations and their impacts on the ecology of local coral reef systems. We will continue to remove as many lionfish as possible from the waters this year and promote the idea of “Kill them, eat them, dissect them and wear them”. 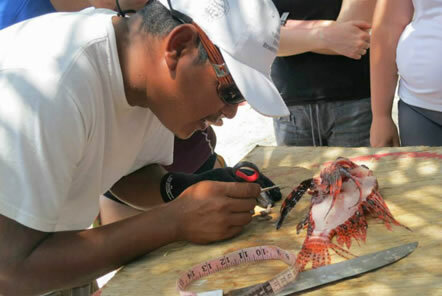 This refers to the process of culling the non-indigenous species, eating the tasty white fillet (and encouraging restaurants to offer this as an option), analysing some of the collected lionfish and submitting the findings to the Belize Fisheries Department and finally wearing the lionfish spine jewellery created by the local women’s group.